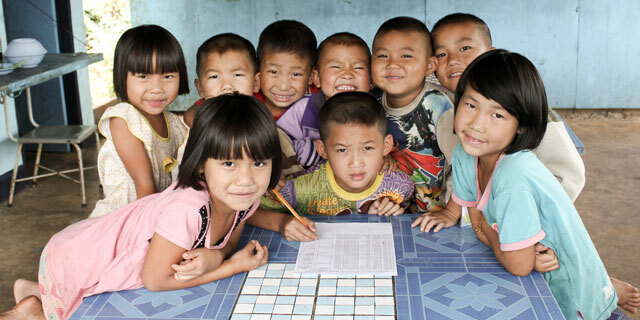 Across the Asia Pacific hundreds of millions of children are vulnerable. Poverty, conflict, HIV-AIDS, and disasters affect both urban and rural populations. Children often pay the highest price. A key feature of World Vision’s work is community development. Thanks to the sponsorship of over one million children in the Asia Pacific region we are able to fund development activities in hundreds of Area Development Programmes and projects across the region. These areas are where World Vision-sponsored children live. They have been identified as especially poor village clusters or urban communities with populations of up to 250,000 people. In a step-by-step process, local leaders first partner with World Vision to identify what keeps people in poverty such as poor maternal healthcare, lack of quality education, limited livelihood opportunities or annual monsoon flooding. World Vision then works with communities to tackle these issues, supporting with funding, skills and encouragement in ways that are appropriate and that give people responsibility for their futures and their dignity. In this way the community itself retains ownership of the development process. The community decides what its development priorities are and works alongside World Vision to achieve its goals. Ensuring that sponsored – and non-sponsored – children go to school is a key component of World Vision’s work. World Vision might also partner to provide micro-credit, improve agriculture and infrastructure, educate pregnant mothers about nutrition and health, work with local churches on programmes to reduce gender-based violence and provide evening classes for adults. These Area Development Programmes impact many millions of people in the Asia Pacific. After 10-15 years they are phased out – allowing the community to continue the journey towards overcoming poverty. Some children are particularly vulnerable and require special support to escape life on the street, bonded labour, abusive homes, the clutch of traffickers and child abusers. Other children are infected or affected by HIV/AIDS and have lost parents and loved ones, facing a challenging future on their own. World Vision provides a range of assistance, including care homes and drop-in centres, trauma counseling, emotional support, skills training and education. The Asia Pacific region is extremely prone to disasters. Droughts, typhoons, earthquakes, tsunamis, floods and mudslides all wreak havoc, especially on the lives of the poor. Civil war, religious, ideological and ethnic tensions, environmental destruction also affect communities resulting in fear, displacement, and loss of life and homes. World Vision is well placed to respond to major disasters. A Global Rapid Response Team of emergency relief experts is available to handle the most complex events. The region also has trained staff ready to respond to local disasters. Pre-positioned aid can be flown in at short notice. One third of World Vision’s Asia Pacific programmes are in disaster prone areas so community development staff work hard to prevent disasters from happening, prepare communities for disaster scenarios and mitigate against their worst affects. If the world is to be changed then the poor and children need to have a voice - and have it heard - and they need to find their own solutions to the challenges they face. World Vision works to have the voices of those we partner with heard at the highest levels of government and at the United Nations, as well as at the village and urban community level. Together we speak out on issues such as maternal and child health, child labour, debt relief for poor nations, and the use of children as combatants in armed conflict.